On view March 24 are two exhibitions that challenge the traditional notions of what art is, and how it should be presented—Richard Tuttle: Loose Leaf Notebook Drawings and Conceptual Art 101: Marcel Duchamp’s Boîte-en-Valise. Works like the ones presented in these exhibitions are often viewed as glorified scribbles by pretentious parvenus whose ignominious works hide behind labels composed by sesquipedalian curators. Preposterous, no? To dispel that idea, we caught up with curator of European and American art Theresa Papanikolas in her office to chat about the upcoming exhibitions. In the museum world, we cringe when we hear someone say “My kid could do that,” and more than any other recent exhibition, Tuttle’s series of watercolor on lined notebook paper seems to invite that kind of response. How do you explain to the layman how there’s more than meets the eye? I think what’s more important is the questions the works raise, rather than the objects themselves. I will say that as watercolors—despite their very simple and one-off appearance—they’re highly sophisticated. It’s really hard to get watercolor to produce color like those in Tuttle’s work. The juxtaposition of colors is really cool. Even when there’s an absence of color there’s something to see there. The more you look at the objects, and the more you spend time with them, if you give yourself the mental time and space to do that you’ll be rewarded. Having said that, the fact that they’re on very low-grade notebook paper adds another element to the work. The watercolor causes the paper to buckle, so they really do look like kids drawings that a proud parent might hang on the refrigerator. So of course people might say, “My kid could do that.” But that’s questioning our assumptions about art, and about materials. Does a well-executed painting have to happen on canvas? Does it have to happen on very fine watercolor paper? Or can it happen on something as simple as a pack of notebook paper that you get at an office supply store? I think when you start to think about those questions it becomes very fascinating. It goes beyond “My kid could do that,” and you start thinking about these more as artworks. Tuttle had specific instructions on how his work should be installed. Can you tell us about his requirements, and what you think was his reasoning behind them? Tuttle was prolific with his notebook drawings, and Herbert and Dorothy Vogel, who were the collectors who gifted these works to the museum, had a lot of these notebook drawings in their collection. They also had an enormous collection of modern art, and when it came time to disperse that collection they felt very strongly that the collection should go into museums. When they were deciding which Tuttles should go to which museums, Tuttle himself was highly involved in the process. He worked with them to curate suites of drawings, which he put in a specific order. The works are hung now in the gallery in the sequence he intended. He also gave very specific framing instructions. The drawings need to be oriented with the holes up, they need to have a certain number of inches of matting around them, and they need to be placed in light wooden frames. He also gave instructions on how high to hang them, which he said should be slightly above eye-level so that the colors will bloom out. Do you think he chose loose-leaf notebook paper as his canvas specifically to challenge the notion that art needs to be on a canvas? Yes, I think his main reason was to question the use of materials in art. I would also say that he was probably interested in how watercolor would act on an inexpensive piece of paper. How could you maintain the integrity of the colors when they’re inevitably going to bleed together? The second exhibition opening next week—Conceptual Art 101—is meant to present Duchamp’s philosophy that art is more about demonstrating ideas then paying homage to a particular object. What ideas is he demonstrating in Boîte-en-Valise? Like Tuttle, Duchamp is questioning the notion, “What is a work of art?” He was part of the Dada movement, and he was usually associated with that group of artists who were disillusioned with the art market, with the state of political affairs, and with all sorts of power structures, and they questioned all of those with their artwork. In many ways they tear down what we think of as a work of art and start over. In the case of Duchamp, his work is about choice: The choice of what to use in a work of art, or what to even call art. In the exhibition you can see pictures of objects that he called “ready mades,” which were just objects in life such as a bicycle wheel, a bottle rack, and, most famously, a urinal, which he would choose and maybe alter in some way, or he might not alter it but say “I’m the artist, and so this is a work of art because I chose it,” rather than mediating that choice by fabricating an artwork. That to me is the main idea in Duchamp’s work—this idea of thinking about artistic choice, and by extension artistic materials. Can it be an industrially produced object rather than a painting on canvas? In fact, the ideas that Tuttle deals with in his work start with artists like Duchamp. I understand there is an interesting anecdote behind how we acquired Duchamp’s Boîte. It was my favorite acquisition. In 2010, I was doing research for the exhibition From Whistler to Warhol: Modernism on Paper. That was my first big show at the museum, and I organized it because I was very struck by the museum’s collection of Modernist works on paper. 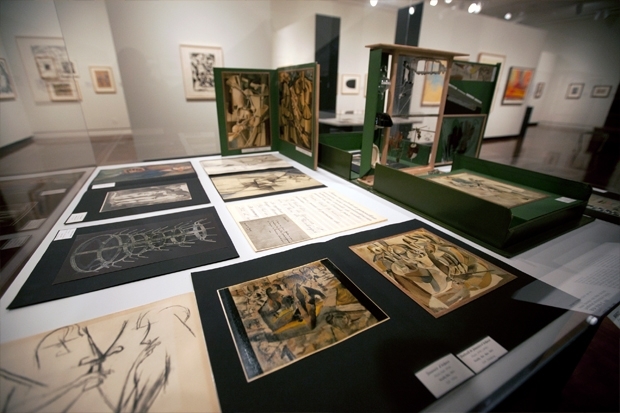 As I was doing research and selecting works from the collection for the show, I realized that we had very few Dada holdings, but we did have a significant collection of artist compendiums and artist books. Just a few days later, a gallery in New York I had been working with on another acquisition emailed me and said, “Hey, do you need a Boîte for your collection?” I’m not kidding. So I said, “Well, yeah!” I thought we could use it for this exhibition and maybe there would be a chance we could acquire it. A very generous donor was so impressed with the exhibition and the museum’s holdings that he stepped forward and purchased the piece for us. So now it’s a part of our permanent collection. Note: Read more about this acquisition in this post from 2010.